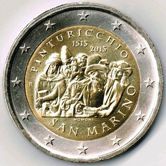 Details relating to the San Marino Commemorative of 2013. This coin honours the Italian painter Pinturicchio. The motif shows an extract from Pinturicchio’s fresco out of the Cappella Baglioni. This is based on an event described in St.Luke 2 41-52. Returning from the Passover in Jerusalem Josef and Mary miss Jesus and finally find him in the temple amongst the scholars, asking them questions. The extract depicted on the coin shows the scholars disputing among themselves , armed with books and counting off arguments on their fingers. Around the upper edge of the inner circle is the inscription-“PINTURICCHIO” and around the bottom “SAN MARINO”. The year of Pinturicchio’s death and the year of issue – 1513 and 2013 are shown immediately above the main image. The mint mark is at three o’clock and under the main image is name of the designer – Momoni. Return from San Marino Commemorative 2013 to euro coin collector.